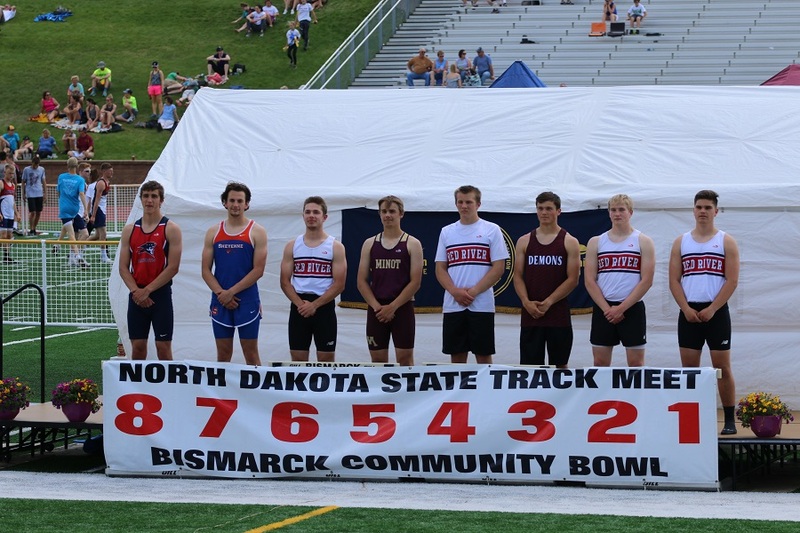 Despite an unfortunate injury to one of the team’s top ranked athletes minutes prior to his first event, the Red River boys pieced together a fantastic state meet over two hot days in Bismarck. With temperatures soaring well over 90 degrees, the Roughriders scored 51 points to finish in 6th place for the second consecutive year. Over the past 21 seasons, it is the program’s 20th top-7 finish. The pre-meet rankings projected senior Tyler Burian to factor into 16 team points at the meet. Those hopes were dashed minutes before the 4×200 prelims when a freak knee injury prevented Burian from running. Alternate Maxx Andrade filled in admirably on a moment’s notice, posting an impressive 22.7 split. Zack Topping (23.3), Thomas O’Halloran (23.1), and George Nyanforh (22.8) all got the baton around and advanced to the finals ranked 7th (1:31.98). In the 4×100 prelims, O’Halloran moved into Burian’s second leg position and alternate Ethan Brandvold ran third. With Topping leading off and Nyanforh anchoring, the quartet cruised to a 7th place ranking of 44.15, advancing to Saturday’s finals and running the 8th fastest time in school history. Also running well and advancing to Saturday’s finals was the hurdle duo of Pierson Painter and Bryce Enerson. In the 300 hurdles, both advanced as Painter posted the 4th best time (40.97) and Enerson the 9th fastest (42.16). Facing a stiff headwind in the 110 hurdles, Enerson sat in 6th (16.17) and Painter 9th (16.80) after Friday’s preliminaries. The highlight of the day and the meet was easily the javelin throw, as Coach Tandeski’s powerful crew came equipped with four qualifiers and high hopes. Although a state qualifier in 2016 and 2017 and an 8th place finisher in 2017, senior Liam Ogren was unranked heading into the meet and threw in the first flight. With most people focusing on the top-ranked athletes in flight two, Ogren managed a small personal best of 167’ before unleashing a 10’ personal best at 176’5 on his third attempt. No one could match him in flight two and Ogren became the surprise winner of the 2018 javelin throw. The event win was not only the first of Ogren’s season, but also the first of his entire career. Senior Sam Schumacher also reached the podium by hitting a new PR of 165’11 and placing 6th. Junior Brett Klefstad, ranked 5th, jumped up a place to finish 4th at 168’4. Senior Seth Hanson, ranked 2nd, fought off a sore arm the whole competition and threw 170’11, joining Ogren as the only athletes to surpass 170’. All said and done, the javelin crew finished 1-2-4-6 to collect 26 points for the Riders. Ogren’s championship marked the 18th consecutive season with a boys individual event state championship for the Red River Boys. For the legendary Coach Tandeski, Ogren became the 29th individual state champion he has coached in his 33 seasons. Painter and Enerson kicked things off Saturday morning with the 300 hurdles final. Both hit new personal bests, with Painter placing 4th (40.17) and Enerson 9th (41.86). The 4×200 followed and the team jumped up a place to finish 6th with a time of 1:31.44. Topping (23.2), Andrade (22.4), and O’Halloran (23.2) got things started well, while Nyanforh (22.6) outleaned a Shanley athlete to ensure 6th place. He took that momentum into the triple jump, where he outperformed his 3rd place ranking to finish in 2nd. His personal best jump of 45’8 was just 3” from the leader, extended his RR freshman record, and moved him to #3 All-Time at RRHS. In the stifling midday heat, the 3200 was run with officials spraying water mists to cool down the runners. Senior Cole Stenseth put forth a fine effort, running a fast first mile and hanging on to manage a slight PR (10:00.34) and finish 10th. Tim Dunham finished 14th (10:13.63) and junior Jake Arason placed 17th (10:26.08). In the 110 hurdle final, Enerson overcame a tough first hurdle and closed strong, placing 4th at 15.53. Painter ran to a new personal best time of 15.89 to place 8th. The two trips to the podium for hurdle events closed a remarkable finish for Painter, who did not start hurdling until the first outdoor meet on April 21. With Nyanforh aggravating his hamstring in the 4×200 and triple jump, utility man Andrade was forced to step up again in the 4×100. With phenomenal handoffs at each exchange, the team of Topping, O’Halloran, Brandvold, and Andrade ran 44.11 and placed 6th. The time is #7 All-Time in school history. The meet’s final event was the 4×400 relay, where Painter (52.9), O’Halloran (52.2), Stoker Short (52.4), and Alessandro Kroeger (54.9) ran to a season-best time of 3:32.45 (11th place). Despite some unfortunate injury setbacks, the 2018 State Meet was a great success and athletes can be proud of a fine season. Best of luck to all of our seniors in their future endeavors! BISMARCK — Grand Forks Red River’s javelin throwers had only one chance to make a statement at the North Daktoa state high school track meet Friday at the Bismarck Community Bowl. They made a statement. Boy, did they make a statement. Led by surprising winner in senior Liam Ogren, four Red River throwers placed in the top six to account for 26 points. What can they do to improve on that performance on Saturday? Nothing. The four throwers were qualified in only the javelin. “It feels great. I want the best for all the guys on our team,” Ogren said. Ogren wasn’t the best Roughrider coming into the state meet. In fact, his 165-5 was the ninth-best qualifying mark and third-best among the teammates. “I had a really good day,” Ogren said. Hanson was second with a 170-11. He came in with a 183-0 qualifying mark, second-best in the state to Minot’s Odin Nelson, who placed fifth. Junior Brett Klefstad took fourth place with a 168-4. His top qualifying mark was 172-5. Senior Sam Schumacher bested his top qualifying mark of 164-2 by throwing 165-11 to take sixth place. The group accounted for all of Red River’s 26 points after the first day, leaving the Riders in fourth place behind Bismarck (41), Bismarck Century (32.5) and Fargo North (28). In the girls’ division, Red River is fourth with 18 points and Central tied for ninth with 10. Maggie Steffen was fourth in javelin and Kaylee Lancaster was seventh. Central was fourth in the 4×800 relay and Rachel Torrey and Mikayla Weiss were sixth and seventh in the 1,600. With the girls, its all over but for today’s formalities. Any number of possibilities remain on the boys side. Indeed, the state Class A boys and girls track meets are genuinely different animals. Reigning state Class A girls champion Fargo Davies won three events and put up 60 points on Friday for a 22-point lead on the field. Bismarck leads a fragmented boys meet with 41 point with Century in second place with 32.5. Fargo North (28), Grand Forks Red River (26), and defending champion Legacy (22) all had more than 20 points at the close of Friday’s action. Competition resumes at 9 a.m. today in the field events. Activity on the track begins at 11 a.m. With six events in the books, there are going to be points aplently up for grabs today. Thirteen finals remain for the boys and girls. Century and Fargo North each garnered two first places on Friday. Levi Rockey successfully defended his title in the shot put with a personal best toss, and the CHS mile relay team turned in a season-best 8:08.48 for first place. North got first-place finishes from Alex Luz in the 1,600-meter run and Collin Stremick in the pole vault. Bismarck moved into the lead by collecting points in all six of Friday’s finals. Derek Leingang took second in the long jump for the Demons’ top point-producing effort of the day. Dane Allen, who may well be the state’s top all-around jumper, placed fifth in the long jump, but that was with just one attempt. He suffered a hip injury on his first try and was unable to jump again. Without Allen’s production in the high jump, triple jump and 400 relay today, BHS will be hard-pressed to hang onto its lead. Allen, a senior, was frustrated at Friday’s turn of events. “It was my (left) hip. My hip gave out on me. We’ll see how it goes (Saturday), but right now I’m hurting,” he said. Allen said his left hip has given him trouble before, but it’s never bothered him like it did Friday. Rockey, the reigning champion in both the shot and discus, got a sought-after personal best of 58-1 in the shot, improving on his previous peak of 57-11 1/2. “I wanted more, but I was happy with the result,” said Rockey, a senior bound for North Dakota State University. Rockey said he scratched on his first throw, and moved into the lead with his second attempt in the preliminary round. His third and final effort of the prelims is when things came together. “In the preliminaries I was pretty consistent, but when I got the finals I had trouble with consistency,” he said. Rockey begins defense of his discus title at 1 p.m. today as the top qualifier at 178-6. Century loaded up its 3,200 relay for the first time this season on Friday, and the results were impressive. The Patriots chopped 8-plus seconds off their qualifying time to win by four seconds. Junior Mitchell Honeyman, who ran leadoff, said this is the best combination the Patriots have put on the track for the two-mile relay all spring. Honeyman, a junior, gave the Patriots a 20-yard lead with his opening half-mile and the succeeding baton-carriers, Austin Wald and Sam Honeyman, kept CHS out by a similar margin. Evan Sayler closed it out with a strong finish. Alex Luz of Fargo North and Meghan Ford of Jamestown used similar strategies to win hard-fought 1,600-meter championships. Luz, a junior, hung close to Century’s Evan Sayler for 1,400 meters and then turned on the juice in the final 200 to pick up his championship with a 4:17.46 clocking. Sayler said he knew what was coming. Ford, a freshman, was the No. 3 qualifier in the mile. She held off a little longer than Luz did, making her move with about 180 meters remaining to pass Megan Lundstrom of Davies. Her winning time was personal-best 5:05.77. “I like to hang behind first place and hope the last 200 meters I can kick a little bit stronger,” she said. Ford, who runs cross country, and has the 3,200, 800 and a relay on her plate today, said her preference is the 1,600. “I kind of feel like the mile is my favorite,” she noted. Fargo Davies served immediate notice that it’s at the MDU Resources-Community Bowl to take care of business. The Eagles scored 24 points in the first event of the meet, placing 1-2-3 in the Class A girls javelin. Sophomore Michaela Hjelseth started the party with a throw of 132-7, almost four feet better than teammate Brooklynn Koenig, a freshman who lofted the spear 128-11. Junior Ryanna Becker places third with a 119-3 effort. “We feel good about the first day. That (javelin) got the ball rolling, for sure,” Davies head coach Rory Beil said. Davies’ other first-place efforts on Friday came courtesy of senior Alya Kretchman, the defending champion in the pole vault, and the 3,200 relay team, which was clocked in 9:39.83. Kretchman and Bismarck senior Blythe Ehrmantraut both vaulted 10-9, but Kretchman had the edges in misses. Beil said his team is well aware of what it takes to win. The majority of the girls who contributed to last year’s winning effort are back. “Most of them have been here before. Most of them are pretty familiar with the meet and that includes some of our javelin throwers,” he observed. The Eagles state meet veterans contribute in ways that can’t be measured by a clock or tape measure. “They create a culture that our younger kids grab onto, and that helps to perpetuate it,” he pointed out. Beil anticipates another strong performance from his team today. “We still have high expectations from a lot of kids tomorrow. … We’ve got multiple athletes in the finals of the hurdles, the high jump, the 100, 200, 400 and 800,” the coach noted. For a while there, Century middle-distance man Mitchell Honeyman admitted things looked a little bleak. But his Patriot teammates changed the complexion of things in time to give Century the state Class A boys track and field championship on Saturday at the MDU Resources-Community Bowl. “It was really worthy of concern,” Honeyman said of the 75 to 55.5-point mid-meet deficit the Patriots faced in their attempt to run down Bismarck for their third championship in four years. “But we had loads of guys who stepped up. … We knew this meet would be super-close, but luckily we had people who stepped up,” he continued. Century finished with a 137.5 to 117-point edge on BHS, and defending champion Legacy came in with 92. Seven first-place finishes helped the Patriots build their winning total. Senior thrower Levi Rockey won the discus on Saturday with a throw of 168-8 to follow up his victory in the shot put. He threw the shot a personal-best 58-1 on Friday. Century won three relays and picked up other firsts from Evan Sayler in the 3,200 and Honeyman in the 800. They sewed up the championship with three wins in the final four events, including the finale, the mile relay. Honeyman, a junior, anchored the 1,600 relay, closing with an anchor leg that moved the Patriots from second to first. “We were down maybe 10 yards or so. I knew I had enough left in the gas tank to finish it up and put the cherry on top for Century,” he said. Honeyman was running his fourth and final race of the meet. Earlier he won the 800, placed third in the 400 and ran a leg on Friday’s 3,200 relay. The Patriots led BHS by 12 points going into the race, so the championship was not at risk. Rockey, a senior, said he didn’t perform in the discus the way he’d hoped, but said he was happy with what his win in the discus did in terms of the team race. “It wasn’t what I wanted to do, but it benefited our team, so I’m satisfied with it,” he said. Rockey threw 168-8, almost 10 feet off his season best, on Saturday. “I was looking to go big this meet, and get as close as I could to the school record (184-6),” he said. Sayler, after placing second in the 1,600 on Friday, came through with a victory in the 3,200 on Saturday by pulling away on the seventh lap. “That’s kind of the plan. Laps five, six and seven are the core laps and that’s where you really have to work,” Sayler said. Fargo North’s Alex Luz overtook Sayler with a closing kick in the 1,600 on Friday, so Sayler and his coaches factored that into Saturday’s plans. The idea was to build a lead that Luz wouldn’t be able to overcome in the final lap. “We weren’t 100 percent it was going to work, but that was our plan going in,” Sayler said. It’s a plan that took Sayler’s strengths into account. “On the sprinter and endurance spectrum, I guess I’ve got the endurance part of it,” he said. Sayler said he knew there was a lot riding on the race in terms of team points. A large part of Legacy’s third-place finish rested on the shoulders of freshman Kalob Larson, who mopped up in the sprints. He said he knew he was in for a battle with Mandan junior Christopher Koester. “He’s beaten me all year, but I’ve been right on top of him,” said Larson, whose state qualifying time was one one-hundredth of a second behind Koester in both the 100 and 200. Larson said his ability to sustain his speed has been a valuable asset. “Usually I still have power at the end when everyone else dies,” he said. Larson won handily in the 400 with a 48.22, outdistancing Bismarck’s Isaiah Olsen by more than a second. That race brought out the best in the Legacy sprinter. “I didn’t expect that. That was a full second better than my previous best,” he noted. Bismarck made its mark in the hurdles, getting wins from David Kpadeh in the 110s and Christian Walth in the 300s. Walth’s winning time of 39.15 was a personal best. “I never thought that I could get under 40 (seconds),” he said. Walth said he prefers the 110s, but is probably better at the 300s. “I run the 110s for myself. I was put in the 300s without my choice last year, and I guess you could say my coach was right,” he said. Kpadeh runs only the 110s and sometimes the two short relays. “I ran the 300s last year and had like a 41.3, but I wanted to focus on the 100s,” he said. Kpadeh, who moved to Bismarck from Maryland last fall, plans to attend the University of Arizona. Two relay records fell in the boys meet. Fargo South’s foursome of Prince Gowah, Targen Gensee, Dawson Breyer and Jon Farr posted a 42.25 in the 400 relay to eclipse the 42.29 run by Legacy last spring. Century’s Hunter Wilmes, Grant Anderson, Oliver Nelson and Caleb Monger cranked out a 1:27.74 in the 800 relay, to better the standard of 1:28.61 set by a CHS foursome in 2017. Class A coaches voted Rockey as the state’s outstanding senior athlete and named Century’s co-coaches, Tim Jacobsen and Justin Miller as coaches of the year. BISMARCK—Dawson Breyer admitted Fargo South’s relays didn’t have the best times during the regular season. But Breyer had hope. He kept reminding his fellow Bruins of a number: 42.29. That was the past North Dakota and overall record in the 400-meter relay. That was before the Bruins broke it. South’s Prince Gowah, Targen Gensee, Breyer and Jon Farr won the 400 relay in 42.25 seconds to set a state, overall and bowl record during the North Dakota Class A state track and field meet Saturday at the Bismarck Community Bowl. The Bruins were working on motivation. Breyer and Farr were on South’s 800 relay team that finished runner-up to Bismarck Century. Gowah, the first leg of the race, said he put pressure on himself to start the race on the right note. Breyer said the handoffs were spot on. The Bruins steadily pulled away during the race and beat Century, which was runner-up to South this time around, by .81 seconds. Even with tired legs after his part of the race, Gowah jumped up and down in excitement as he saw his teammates finish the victory off.